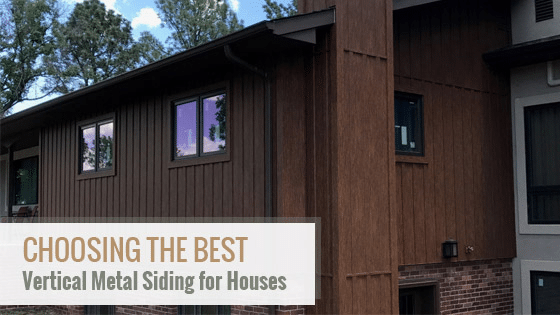 Vertical siding looks sophisticated, clean, and just different enough to stand out in a neighborhood of horizontally-clad homes. There are different styles of vertical siding to choose from as well. Simple vertical planks are one of the most basic styles, while board and batten designs offer a bit more from an aesthetic perspective. Board and batten siding is any type of vertical siding in which wide planks are spaced with a narrower piece in between. This design gives depth and texture to the exterior walls and attractive farmhouse charm. 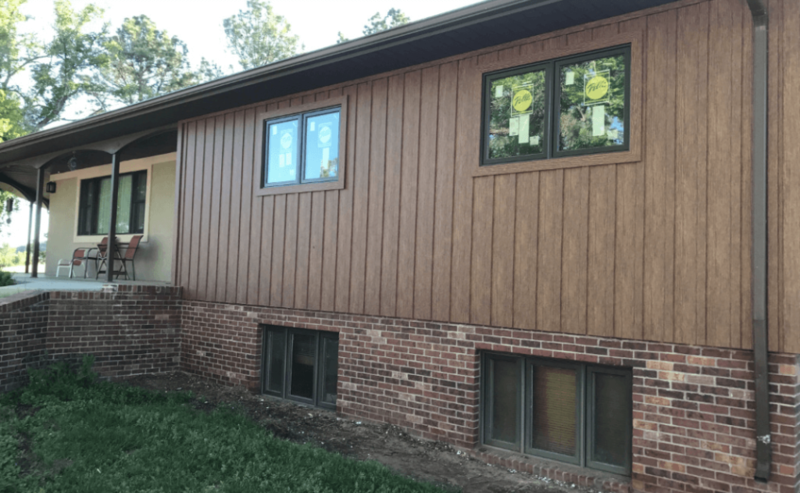 Originally board and batten vertical siding was made from real wood and more recently with vinyl. Real wood is certainly a stunning choice, but the high-maintenance needs make it a challenge for busy homeowners. Vinyl is often promised as being the low-care alternative, and though it doesn’t have the need for surface treatments, vinyl is often more fragile than it’s marketed to be. Homeowners that want maximum protection and beauty from their vertical siding should consider metal as a superior material. The days of metal siding only being used for industrial applications have long been over. Modern metal siding is very competitively priced, well-built, and comes in a plethora of color and texture options. However, it’s important to understand some differences between metal materials. The two metals most often used for residential home siding are aluminum and steel. Although both are durable options and at first glance seem nearly identical, each material has pros and cons. Aluminum is very lightweight and tends to less expensive when it comes to metal siding. However, the lower price and lightweight nature come at a cost. Aluminum may be tough compared to vinyl, but compared to steel it isn’t as durable. Aluminum vertical siding is likely to become dented and scratched. Another common issue is color fading and a chalky film developing after a few years. To get the most from your new vertical metal siding, going with steel is the smartest option. 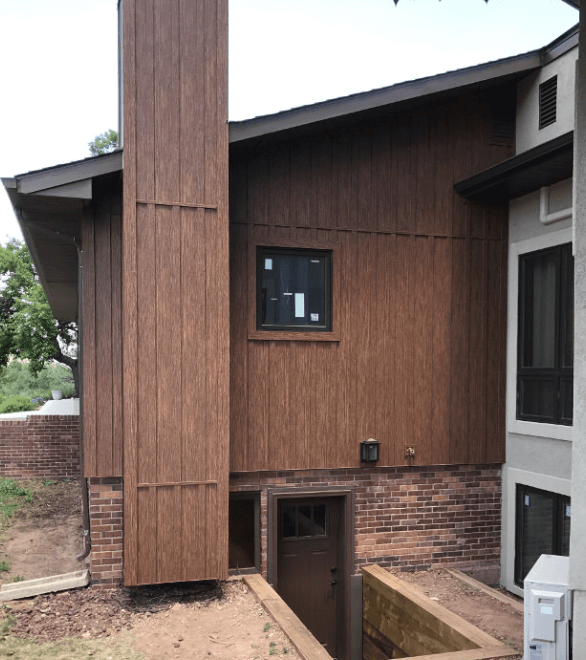 TruLog’s Steel Board and Batten beats aluminum in terms of appearance, color-fastness, and overall performance. Steel siding is thicker than aluminum, which makes it a bit heavier but also means it will stay on your walls for longer. There is a reason why homes in regions prone to very high winds or hurricanes are often outfitted with steel siding over any other material. If you live in a region where heavy snow and hail also occur, you’ll find that steel will remain unblemished and straight for longer than aluminum. Steel siding color doesn’t fade as aluminum is prone to as many manufacturers bake on the color coating rather than paint it. Many companies include impressive warranties that guarantee that their color will stay for the life of the steel. Steel comes in just as many color options as aluminum, with TruLog offering a particularly beautiful range of 4 standard and 3 premium color options. Some examples of these shades include Autumn Brown, a rich chocolate tone reminiscent of fresh timber, to Barnwood Gray, a trendy gray wood shade similar to aged driftwood. As the name suggests, TruLog’s Board and Batten colors are all textured to resemble natural wood grain. This adds a realistic timber feel to your home, which many homeowners would consider more welcoming and warm. The siding you choose for your home is the ultimate investment and should not be taken lightly. It only makes sense to go with steel board and batten to keep your home looking beautiful for decades, without you needing to do much more than hosing it off when it becomes dirty. 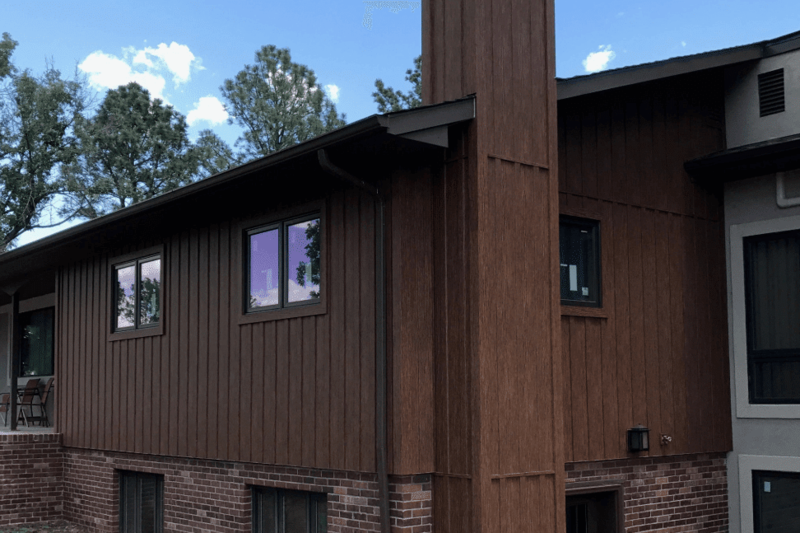 TruLog Board and Batten is an excellent material choice for homeowners that want vertical siding that is durable and beautiful. Being a steel product, TruLog Board and Batten are going to protect your home for decades to come with minimal effort on your part. Unlike aluminum, TruLog steel’s color won’t fade or develop a chalky appearance over time. For more information on TruLog’s Board and Batten siding for your home, get in touch with a representative or consider requesting a sample kit to see this material in person.